Original formula from QST Sept, 1974. I used this formula and it seemed to work pretty accurately for centre loaded quarter wave antennas on the 160m band. The original formula was in inches and feet, so with Jack’s permission, I have modified the script to work with metric units, and this is presented below. The calculation refers to either a loaded 1/4 wave (typically a vertical, in which case flip the picture below through 90o) or a loaded dipole, in which case the dimensions refer refer to one arm and two coils will be required. I used centre loaded. Base loaded will require a lower inductance and more towards the top will require more inductance. The antenna can therefore be matched by creating a fixed inductor at say the centre and moving it up or down until you have a good match on your desired frequency. You will need a good ground system with an end fed quarter wave, but use two in a dipole for a nice shortened loaded dipole antenna. I had previously built an inductor using this calculator for a 9m fibreglass pole on 1.9MHz which worked out to be around 195µH for centre loaded. The same inductor could be used with a larger pole, an 18m (60ft) spiderbeam fibreglass pole by moving it up further from the feedpoint. The calculator suggested that for an 18m vertical to resonate at 1900kHz with a 195µH inductor, it should be 13.1 metres up from the feedpoint, leaving 5 metres of wire above that. We used a fence made of chicken wire for the ground, which although crude, seems to be quite effective in previous tests at this location. 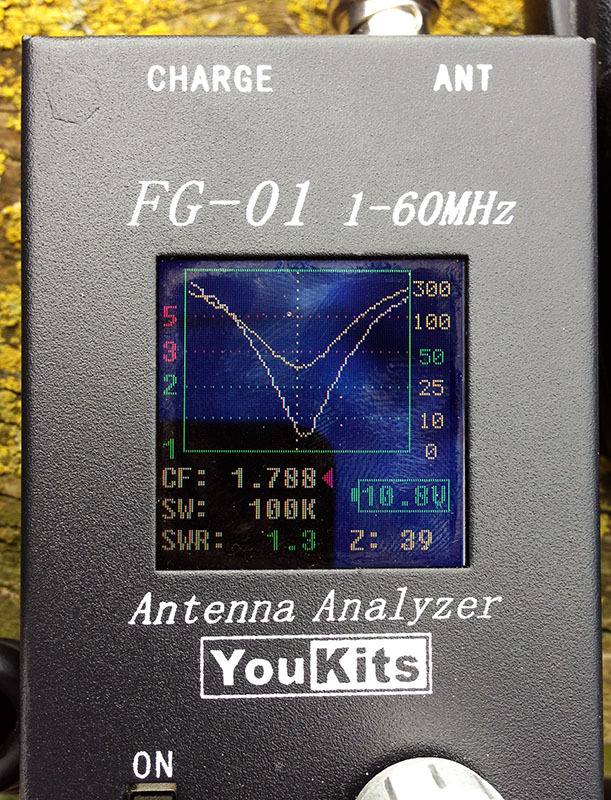 YouKits FG-01 Analyser showing resonance and bandwidth. Once the aerial was setup, the analyser was plugged in to see where the 50Ω match was. It was a little lower than planned, at 1800kHz. 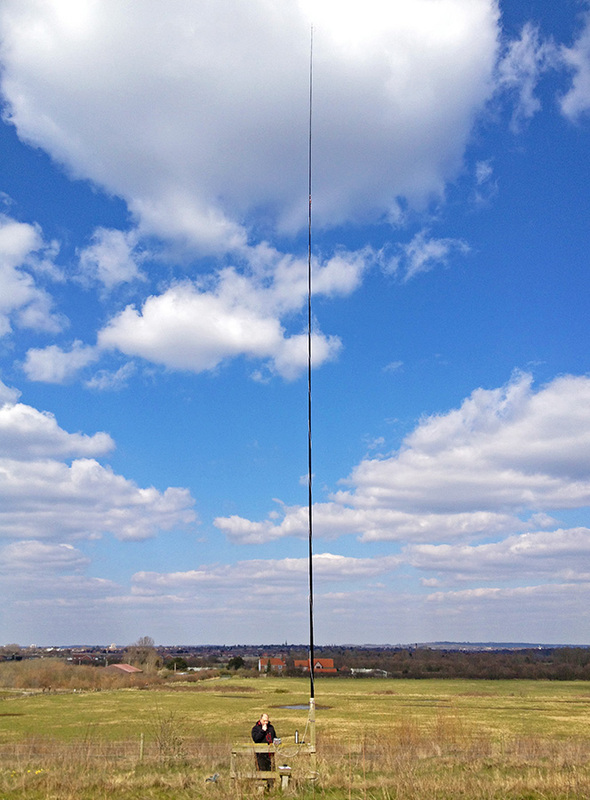 It’s still nice to see an antenna giving you a match at this frequency! The 50Ω point was easily brought up the band to 1910kHz with an ATU for simplicity, however this could have been adjusted by moving the inductor slightly closer to the feedpoint. Dave M0TAZ operating on 160m with the loaded quarter wave. I need a cheap vertical for 10.1 mHz. I’m thinking a 102″ cb whip, base loaded. It will be based about 8′(~2.4m) on a wood gazebo frame, with radials snaking down from there. The gazebo is a Star Plate dome, from Stromberg Chickens. I run 10-40m mobile with what you are using or going to use.. If i can hear them i can work them, thats on 40m!! ALSO bigger dia the coil the better ( within reason) 2inch white pvc waste pipe seems to work well atleast up to 100w..mines filled with fibreglass.. If it is a quarter wave vertical, It needs counterpoise or a ground plane. Please let me know what looks like your ground plane wire for this antenna.. Here, we are using a long wire mesh fence. Hi John, how are you? Sorry for my ignorance, but the field “Wire diameter” is for the wire used for the loading coil? Or is for the diameter of the wire assuming your vertical (Or loaded dipole) would be done using wire? Hi Francisco. I’m good thank you! The wire diameter here is the wire that you use as the antenna element, not the inductor. Yes, if you use tube, this will be the diameter of the tube. Just bear in mind, its a ballpark figure! In yours tests, how many the coil position affect the eficiency of the antenna? I found coupling worked best when the primary was in the centre of the secondary, as pictured. I am very happy to find your web, since I want to build a short 80m antenna. 1. If I use two different aluminium tube sizes (smaller size slides into the bigger one) for radiator, which diameter I should consider in above calculator? 2. I plan to build dipole antenna as the calculator described, which is better, vertical or horizontal polarization? The antenna intended for DX’ing. And I plan to raise it about 6-8 meter above ground. 3. 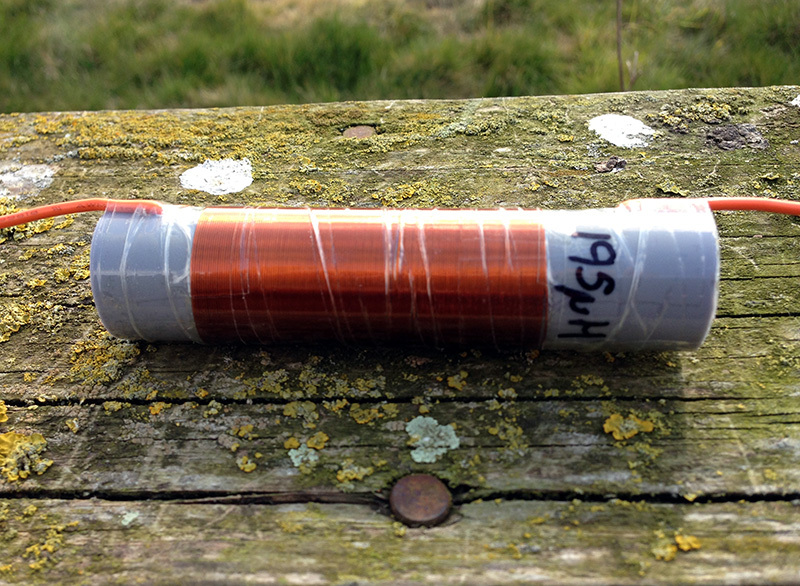 Or, do you have other and simple design for 80m antenna for very limited space and capable for DX ing? 1. It would be difficult to calculate. You might have to experiment by adjusting the inductance. 2. I would go with vertical for DX. Not sure how you would do this though if its only 6-8 meter above ground. Elevation is key for DX work, to get the low angle of radiation. 3. Limited space and DX, it would have to be some kind of vertical. A loaded quarter wave made from wire on a fibre glass pole would be my choice for a portable setup. Maybe something more substantial for permanent outdoor use. Jim, I stumbled upon your page here and it helped me build a nice 1/4 wave vertical for 6 meters. I wanted an antenna on a top mount for my pickup, shorter than required for actual 6 meter 1/4 wave. I used your formula and wound the coil directly onto a cut-down Shakespeare VHF marine antenna cut to 30 inches and machined a stainless plug for the top with a hole and setscrew for a 1/8″ whip. It clears about everything. I finished the antenna after matching with a length of shrink tube to cover the lower section. It matched up almost right out of the box. Thanks for the great info and easy to use formula. Glad you had success with a 6m 1/4 wave on your truck! Thanks for letting us know.